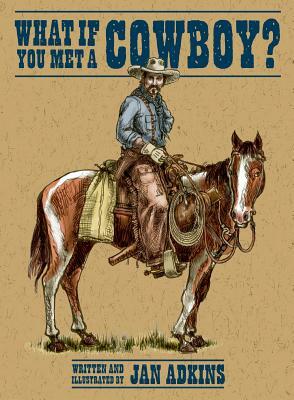 You know all about cowboys, right? They're the good guys in the white hats, carrying six-shooters and wearing fancy boots. Well, no. Cowboys weren't like that at all. Come inside and meet Jake Peavy. He's the real deal. Jake's a crackerjack cattle herder but he wears a grubby hat and he limps from when that horse fell on him. He's small, wiry, has bad teeth, and it's been a while since he washed. Come spend some time with Jake, his saddlemates, and his fleas. You'll learn all about riding the range, roping dogies, and surviving in the down-and-dirty world that was the REAL wild West. Jan Adkins is the author of books including Bridges: From My Side to Yours and What if You Met a Cowboy? He lives in the San Francisco Bay area.